I’m going to wax philosophical after all of the talk since RootsTech about a genealogy technology revolution. I recently got to thinking how genealogy isn’t the only realm in which big changes are happening (and I’m not just talking about the Middle East either). The most recent copy of American Libraries from the American Library Association includes an article titled “Is ALA Ripe for Rebellion?” (January/February 2011, page 84). The Special Libraries Association recently went through an “alignment” process that included an attempt to change the name of the association. In both of the above instances, the associations are struggling to keep up with the times and the needs of their members. Technology is playing a big role in the challenges they are facing and the solutions available to them. I think genealogy is experiencing a similar shift and the RootsTech conference brought the issue front and center. Indeed, when a thunderstom rolls through, it usually clears the air and leaves the ground ripe for new things to grow. Many in genealogy may view the recent talk since Rootstech as a disruptive thunderstorm, but the changes brewing will lead to many new possibilities and opportunities. 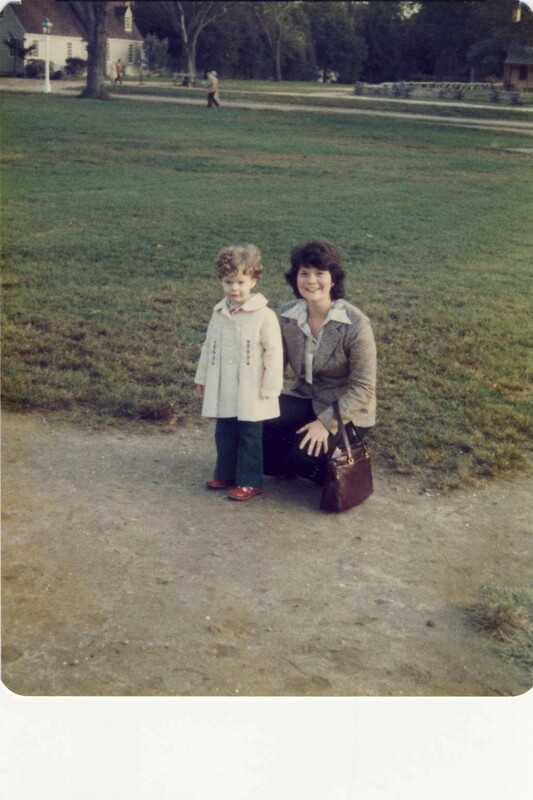 When I was nearly four years old, my parents and I visited England and Ireland (my dad had a medical conference in one of the two countries). It was very eventful and I have many memories: watching the rabbits on the front lawn of our hotel, riding through the Gap of Dunloe in a horse-drawn carriage, etc. One incident that I *don’t* remember is still one of my favorite tales to tell from that trip. It’s the time I saved my dad from an Irish almost pub fight. As those who may have traveled to Europe know, many roads were not paved with large or even small vehicles (or even bicycles) in mind. They are beyond narrow. It was down such a road in a town in the Ring of Kerry that my father was navigating our rental car when he accidentally sideswiped another vehicle. That other vehicle was parked outside of a pub. So my dad returned to our car and waited. I probably didn’t really understand what was happening, but I could feel the tension crackling in the air as my parents waited for the car’s owner to emerge. Influenced by said tension and my small stature, one can hardly blame me for my reaction when the door to the pub opened. Now, you must understand, my dad was 6’1″ tall. Not a small man. But the man who emerged from the pub was taller, with flaming red beard and hair. So I did what any other self-respecting almost-four-year-old would do. And then I started crawling over my mom to try and get as far away from the giant as possible. Well, Johnny the Giant, obviously wasn’t expecting me. He immediately apologized to my dad for scaring me and waved away the damage to the car. “Go on and enjoy the rest of your vacation,” he said. And so we did. And I eventually forgot about Johnny the Giant until about 10 years later when my mom told me the story. She said Johnny probably wasn’t even the owner of the car that my dad hit — the bar patrons probably wanted to play a joke on the American tourists by sending out the biggest, scariest man in the bar. 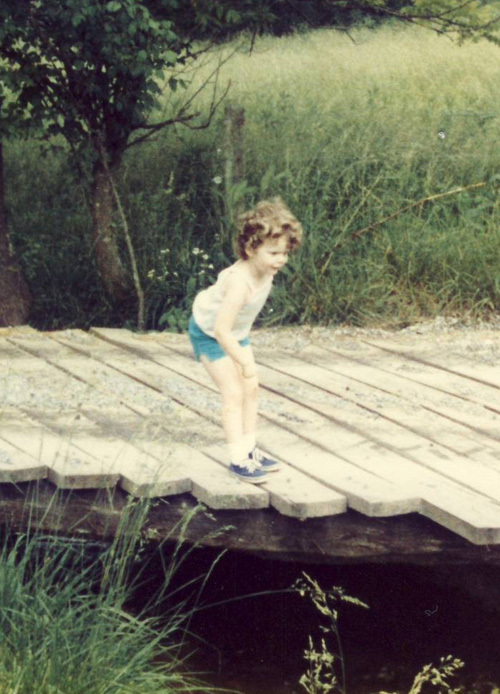 Well, what’s the biggest, baddest Irishman against four-year-old me? A big ol’ softie, that’s what. I didn’t want the last days of February — Black History Month — to slip away without relating one of the more awesome experiences I had back in my reporting days. 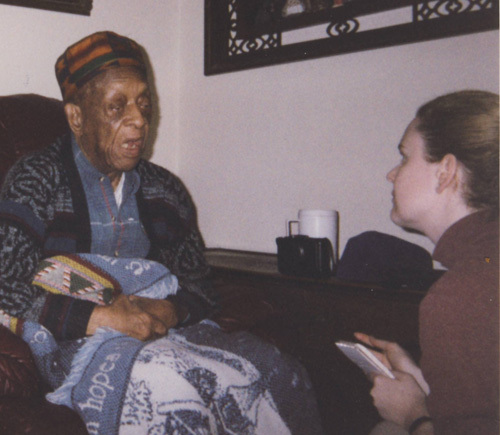 In 1998, I had the chance to interview Mark Matthews, age 103 at the time, and one of the last surviving Buffalo Soldiers who fought in the Old West. I met with Matthews in the home of his daughter, not far from the Maryland/Washington, D.C., line. The first time I arrived to interview him, with a photographer in tow, we were refused because he didn’t feel up to having his picture taken that day. The photographer was disappointed, but when you’re 103, you call the shots. The second time we arrived for the interview, Matthews was feeling better. Much better. I asked him one question and he talked for 40 minutes. I asked him a second question and he talked for 30 more minutes. When it came time for the photographer to take his picture, Matthews donned his cavalry hat, sat up straight and jutted out his chin, though he could barely see the camera that was pointed at him. 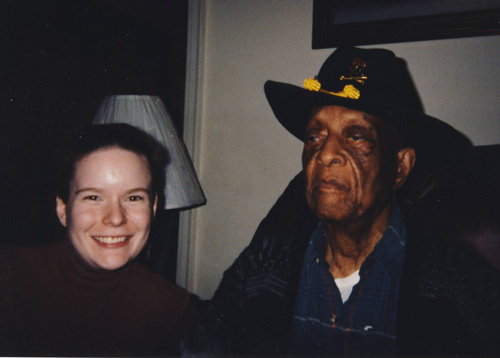 He joined the Buffalo Soldiers 10th Cavalry shortly after meeting some of the soldiers when he was only 15. A friend helped him forge papers he needed to join up because you had to be 17 at the time to enlist. Matthews was part of the border patrol at Fort Huachuca, Ariz., where he encountered bandits, including Pancho Villa’s men. He also served in World War II. He later was stationed at Fort Myer, Va., where he performed in drills for the likes of Queen Elizabeth II. He got to meet President Clinton twice. At the time I wrote the article, it was believed that Matthews was the last surviving Buffalo Soldier from his regiment. Over time, I often wondered what happened to Matthews. After years went by, I thought surely he must have passed away. Turns out, he lived until he was 111 years old! I found this tribute page with the text of his 2005 obituary from the Washington Post. It is noted in his obituaries that he was the oldest surviving Buffalo Soldier before he died. He also was the oldest man in Washington, D.C.
It’s been nearly 12 years since the interview and I still can’t believe I had the opportunity to meet this man and hear his incredible story first-hand. This is a gap in the fence that separates the Tylor House in Easton from its neighbor to the south. Rumor has it that two sisters once occupied the Tylor House and the residence next door and left the gap in the fence to make it easier to visit one another. 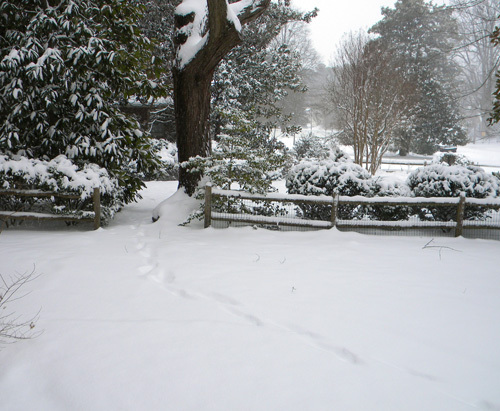 The footsteps in the snow in this pic were left by the mailman. These days, he’s the only one to make use of the pass-through. When Wilson Tylor built the Tylor House, the parcel of land that it sat on was pretty large. That parcel has since been divided into other lots. Did he build a house on the adjacent lot for one of his daughters? Or was it a subsequent owner and her sister that were neighbors? I’ll need to do more digging into the history of both properties to find the answer. My sister and I happened upon this tombstone whilst wandering around the “Old Gray Cemetery” in Knoxville, Tenn. I couldn’t make out the name on the stone, but the first name appears to be Ebenezer. As mentioned in this past weekend’s SNGF and yesterday’s Tombstone Tuesday post, my sister and I visited Elizabethton, Tenn., in the state’s northeast corner, during the holidays. 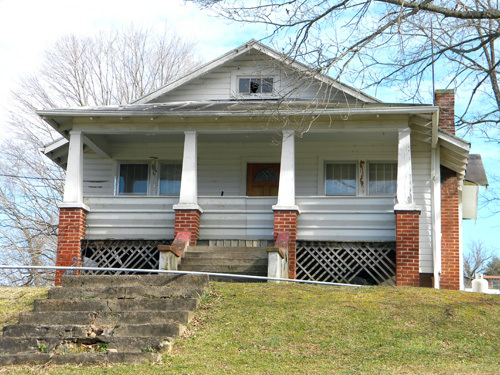 Elizabethton is where my great-grandparents William E. HAYES and Della M. CROW raised my maternal grandmother and her siblings. The last time we were in Elizabethton, I was six years old. I have many memories of that trip and I was excited to revisit my great-grandmother’s home (since sold to a distant relation). 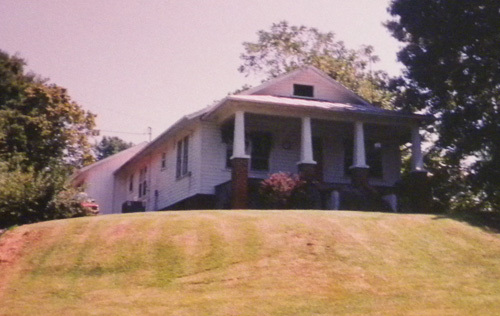 After meeting up with our great-uncle, Ben Hayes, he drove us to the old house on Poplar Branch Road. It was nothing like I remembered. First of all, everything seemed a lot smaller — of course, I was small myself the last time I was there. A creek passes through the front yard. Where once there was a wooden bridge (see below), there is now an asphalt walkway. We had always visited in the summer months, when everything was hot, green and thriving. When we visited last week, it was cold, gloomy and barren. Sadly, the change in season is not the only reason the property seemed so different. It has fallen into disrepair. It desperately needs a new coat of paint and there was an accumulation of junk and vehicles in the back yard. The front porch, on which I remember playing in the shade during my visits to Grandma Hayes’ house, is blocked with a long piece of corrugated metal. The stone steps leading up to the porch appear to be crumbling. The attic window above the porch is busted. I’m really sad to see the changes time and neglect have wrought on the property because I do have several fond memories from our visits there. 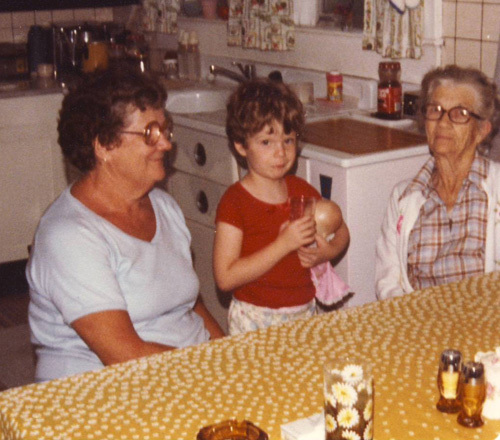 I can still smell the aromas of bacon grease, green beans and biscuits that seemed to be ever-present in Grandma Hayes’ kitchen. 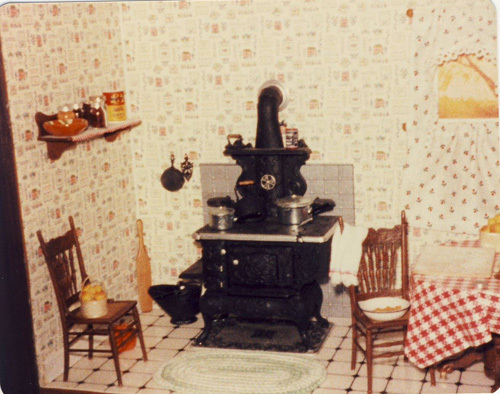 Back when my mom was working in miniatures, she created two tiny room boxes that were replicas of how Grandma Hayes’ kitchen looked, once upon a time. One is pictured below. Despite the dilapidated state of the house, I was still glad to revisit Elizabethton and especially to catch up with our Uncle Ben. He drove us all over Carter County in search of good BBQ for lunch and filled us in on the history of the area. He drove us into the older section of downtown and showed us a preserved covered bridge and two of the town’s war memorials, including one where he’d purchased bricks to commemorate the service of some of our family members. I still have more genealogical work to do in that area — I’d like to find the farm originally owned by William Hayes’ parents and also their grave sites. 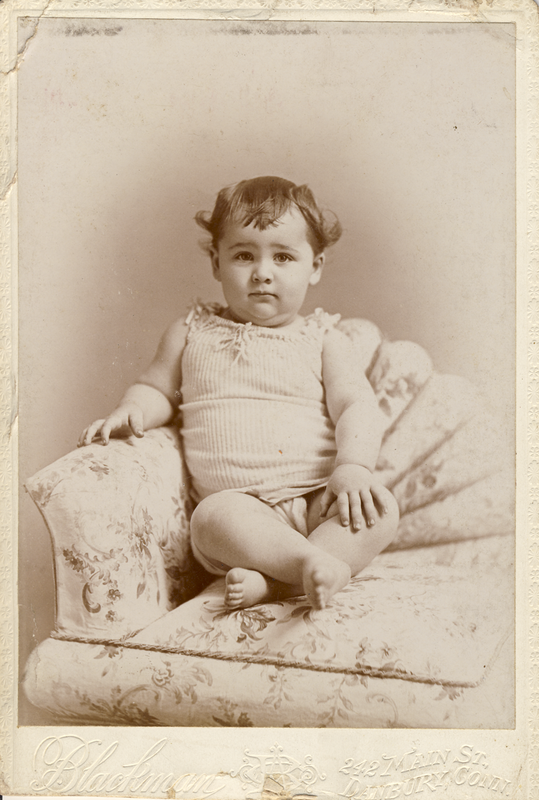 I’m also still trying to confirm the identities of William’s grandparents. Luckily the FGS 2010 conference is in August in Knoxville, so I intend to turn that into a genealogy trip too.